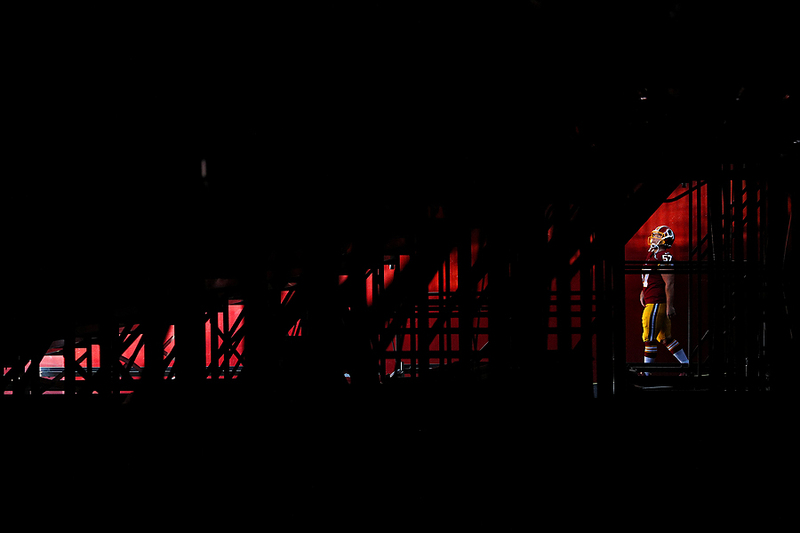 "Long snapper Nick Sundberg #57 of the Washington Redskins takes the field before playing against the Denver Broncos in a preseason game at FedExField on August 24, 2018 in Landover, Maryland." Making an entrance in football usually means lots of pageantry. From fireworks, smoke and loud music - it's all visual and a great way to start a game for players, fans and photographers alike. However, I am always trying to look for interesting moments before that. How does one's body language communicate nervousness or even excitement? Many years ago I photographed referees very similar to the above image. Yet last year I found a most graphic element to this rectangle and decided to explore it the other night. Shape and color are great - but getting a little moment like looking to the field, fans - is always the cherry on top of the ice cream.